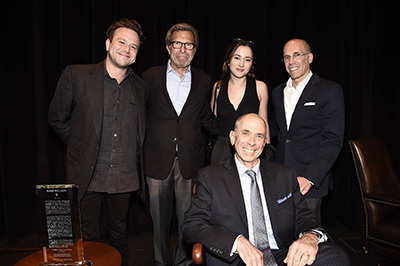 On June 6, 2017, the USC School of Cinematic Arts celebrated the life and legacy of the late comedy genius Robin Williams with the dedication of the Robin Williams Endowed Chair in Comedy. 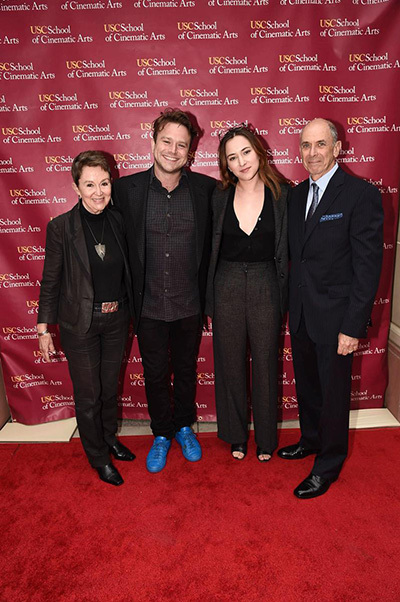 Barnet Kellman, SCA Professor in the Division of Film & Television and Co-Founder of USC Comedy, was honored as the inaugural chair, which was graciously funded by the George Lucas Family Foundation. The evening was a lively and often emotional affair attended by alumni, faculty, staff, supporters, friends, and family of the School, including Williams’ daughter Zelda and son Zak, who offered remarks following an introduction from Dean Elizabeth M. Daley. Kellman was nothing short of verklempt himself as he took the podium, expressing his overwhelming gratitude to Zak and Zelda for sharing this evening with them and for Zak’s moving words, as well as to Dean Daley and the School for this tremendous honor. “It is just a privilege to be talking about Robin tonight,” said Kellman, describing the comic legend as “comedy incarnate.” He recalled asking Williams’ Mork & Mindy co-star Gina Hecht how to talk about Robin Williams. “You can’t overuse the word ‘genius,’” she had told him. Williams was a singular talent whose lauded career spanned from the stages of comedy clubs and Broadway to screens silver and small. A rapidly ascending star of the stand-up comedy scene through the 1970s, Williams burst into America’s living rooms as Mork from Ork on the hit TV comedy Mork & Mindy, for which he won a Golden Globe and was nominated for a Primetime Emmy. Indeed, Williams’ unique brand of frenetic physical comedy and masterful impressions was out of this world, “the comedy world equivalent of a meteor streaking through the atmosphere,” as Dean Daley stated in her opening remarks, citing the commemorative plaque that hangs in the lobby of the Steven Spielberg building. In no time, Williams became a household name, immortalized not only for his iconic comedic roles—from Adrian Cronauer in Good Morning Vietnam, to Mrs. Doubtfire, to his legendary Genie in Aladdin—but also for his captivating and poignant dramatic performances in films like Dead Poets Society and Good Will Hunting, for which he won the Oscar. Whether in comedy or drama, stand-up or improv, what united Williams’ work was always his merciless search for truth, a desire to reveal to us our most animalistic and most human selves, and permit us to laugh at both. 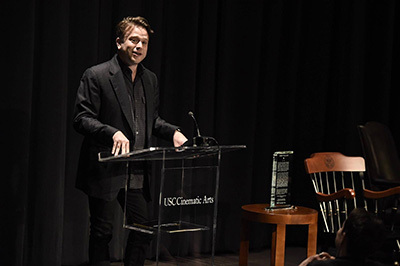 And as Zak Williams aptly pointed out in his own remarks, there is no more appropriate professor at USC to carry on that legacy as the Robin Williams Endowed Chair in Comedy. Kellman is not only an accomplished comedy director—he is responsible for over thirty pilots and won two Emmy Awards and a DGA Award for his work on Murphy Brown, of which he directed 75 episodes, including the pilot and finale—he is also one of the School’s most staunch advocates for the importance of comedy as a serious academic subject, one that should be studied with the same vigor as any other segment of the cinematic arts. Williams believed in the power of comedy to inspire and reveal greater truths, something that he advocated for in the two short video clips screened following Kellman’s remarks. Kellman believes this as well, not only as a renowned comedy director, but also as a professor working to train the next leaders in comedy. 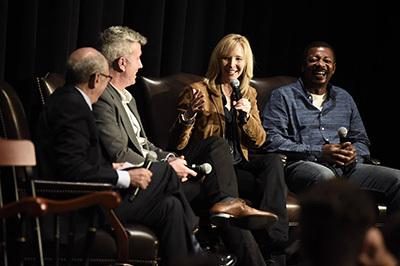 Following the video clips, Kellman sat down with three current leaders in the comedy world— actress and SCA parent Lisa Kudrow, director and Alumni Development Council member Peter Segal, and writer/director/performer and newly appointed SCA professor Robert Townsend—to reflect on Williams’ legacy. The panel swapped stories of working with Williams, recalling what it was like to witness Williams’ genius first hand, which Segal compared to what it must have been like to watch Mozart compose a new piece. They remarked at how the greatest comedians have a knack for making everything look improvised, as though the jokes just easily and naturally come flowing through the individual. That was especially true of Williams, but as Zak mentioned during his own remarks, his father worked obsessively hard—“I would watch him spend endless hours honing and perfecting his craft. He would always be iterating and tuning.” And when the panel asked Zak whether or not one of the clips shown, which featured Williams seamlessly weaving across a dozen different impression spanning multiple languages and dialects while reflecting on the value of comedy, was improvised or rehearsed, Zak’s answer was neither. This is exactly why Kellman, along with Jack Epps Jr. and David Isaacs, co-founded the USC Comedy initiative in 2011: to help students develop that muscle. When Segal brought up the importance of innate talent when it comes to comedy, Kellman hesitantly agreed, but also made clear that comedy should not be treated differently than other crafts in terms of the diligence and training it requires. “As you said, you can’t teach a person who is tone-deaf how to sing. But we teach singers all the time,” said Kellman, wondering if Mel Brooks’ “you got it, or you ain’t” approach to comedy is the reason why USC remains one of the only cinematic arts programs with a curriculum dedicated to studying comedy. Robin Williams was inherently gifted, a singular genius in the comedic world. But just because the genius of someone like Williams cannot simply be taught does not mean for a second that Williams’ genius arose without any teaching or training. There will never be another Robin Williams, but there will be another comedic genius—likely more than a few. And if that individual is lucky enough to land in a class with Professor Kellman, perhaps they too can follow Williams’ lead as an inspiration to hone their craft and find truth in laughter, just as he did.